Antiques price guides have always been an important tool for antique dealers and collectors alike. With the internet taking front and center stage in offering the most current information, antiques price guides can now offer up-to-the-minute information to help you identify and value your treasure. But how do you make the most of price guides to help you price or value your antique? Identify the type of antique, such as glassware, porcelain, furniture or collectible; and use the most specific antiques price guide you can find. It can be difficult for the novice or beginner collector to find the correct terms to even start them on their way to searching on the internet. Sometimes pictures are worth a thousand words, they can help not only in valuing your antique, but in finding the right terminology to help you describe it. Antiques price guides offer hundreds of photographs, so they can be a good starting point for your search. Google images is another starting point in identifying antiques and is the best bet when you’re not quite sure what it is that you have. While that antiques price guide may say that a Limoges punch bowl is worth $3,500, it doesn’t necessarily mean that YOUR Limoges punch bowl is worth that much. Factors that can affect values in antiques price guides include condition, size, maker, decoration and rarity. All those items together make up the value of an antique, and it can mean your cracked Limoges bowl decorated by an amateur artist may be only worth $50. 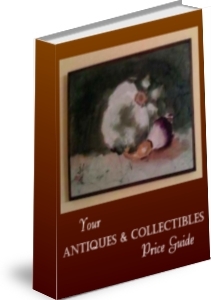 Using antiques price guides is just one step in determining the value of your antique. While the guides may tell you that your grandmother’s handmade quilt is worth only $25, its value to you and your family’s history – priceless.